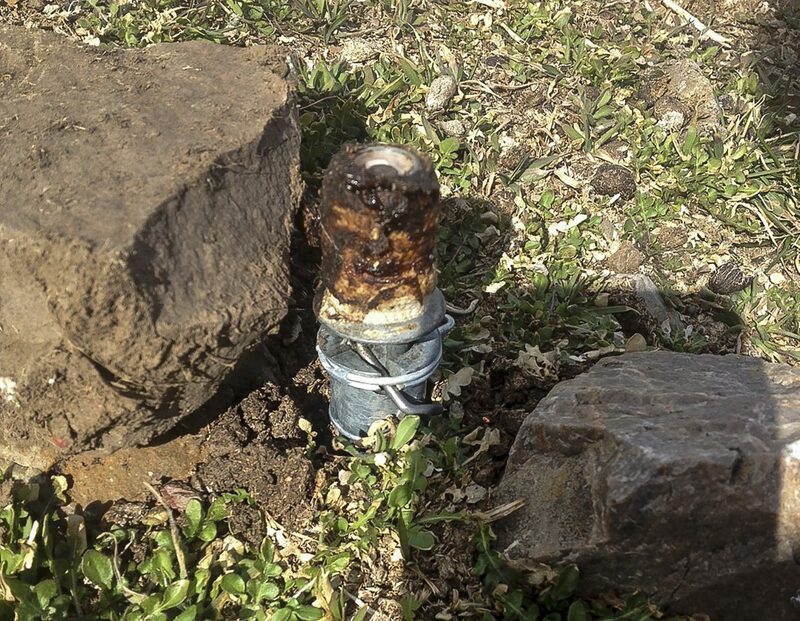 This photo from March 16 released by the Bannock County Sheriff's Office shows an M-44 cyanide device in Pocatello, Idaho. U.S. officials have agreed to stop using predator-killing cyanide traps on Colorado public lands amid pressure to ban the devices nationwide after one injured an Idaho teenager and killed his dog. Court documents filed Monday show the U.S. Department of Agriculture has agreed to stop using “cyanide bombs” pending further study. A judge must approve the agreement. The groups WildEarth Guardians and Center for Biological Diversity sued the government in April alleging cyanide traps meant to protect livestock from predators can kill indiscriminately. An agreement is pending in a separate lawsuit challenging the devices’ use nationwide. A ban on the traps already was in place in Idaho when a 14-year-old boy triggered one near his home in March. They remain in use elsewhere to kill thousands of coyotes and other predators annually.